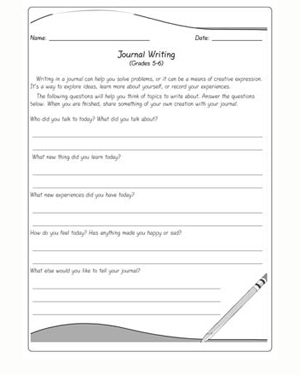 Journal writing is highly recommended by educators. It is both therapeutic and educational. Students get to practice and experiment with different learning styles, and slowly improve their writing. They get to reflect upon problems and record important experiences. While the benefits are numerous, not everyone is fond of journal writing. Some students take to it like a fish in water, while other need help getting started. Use this printable writing practice worksheet to help 10 year olds get used to recording their everyday thoughts and experiences.